DIGITAL CUSTOMER ENGAGEMENT MANAGER Adriana Namuche adriana@folioweekly.com / ext. 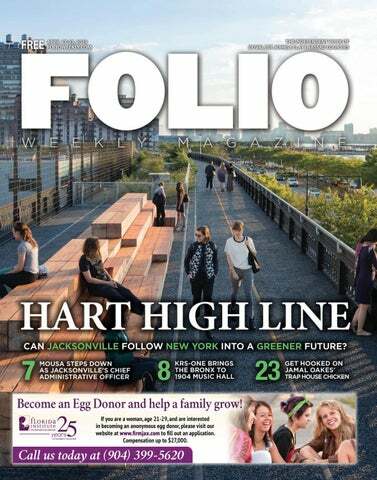 130 FOLIO WEEKLY MAGAZINE PUBLISHES EVERY WEDNESDAY FOR DISTRIBUTION IN DUVAL, NASSAU, ST. JOHNS AND CLAY COUNTIES. It contains opinions of contributing writers that are not necessarily the opinion of this publication. 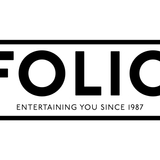 Folio Weekly welcomes editorial and photographic contributions. Calendar items must be received two weeks in advance of event date. Copyright © Folio Publishing, Inc. 2019. All rights reserved. Advertising rates and information available on request. Advertiser purchases right of publication only. One free issue per person. Additional copies and back issues are $1 each at the office or $4 by U.S. mail, based on availability. First Class mail subscriptions are $48/13 weeks, $96/26 weeks, $189/52 weeks. Folio Weekly is printed on 100 percent recycled paper, using soy-based inks. Please recycle issues of Folio Weekly. Application to mail at periodicals postage prices is pending at Jacksonville, Florida. POSTMASTER: Send address changes to Folio Weekly, 45 W. Bay St., Ste. 103, Jacksonville, FL 32202-3632. LEND YOUR VOICE If you’d like to respond to something you read in the pages of Folio Weekly, please send an email (including name, address and phone number for verification purposes only) to mail@folioweekly.com, visit us at folioweekly.com or follow us on Twitter or Facebook (@folioweekly) and join the conversation. A Nassau County developer’s plans WS-LEADER E N H C A E B A are causing consternation on the FERNANDIN south end of Amelia Island, as Julia Roberts of the Fernandina Beach News-Leader reported on April 11. Signature Land, based in Yulee and owned by Steve Leggett, is in talks with the Richmond-based Riverstone Group to purchase “50 acres of forested land overlooking the ocean between The Sanctuary subdivision and Amelia Island State Park.” In response, Creighton “Corky” Hoffman, president of The Sanctuary Homeowners Association, convened a crisis meeting “drawing approximately 200 people.” The neighbors are looking to stop Leggett and co. before the deal has even been sealed. Why are they so worked up? Roberts wrote, “Hoffman said Leggett’s company is under contract to pay $70 million for the property [appraised at $41.35 million], but that sale is contingent on some conditions, which include Leggett receiving a Future Land Use Map amendment and zoning changes from the county and completing due diligence on the purchase within a year.” The exact nature of Leggett’s plans are nebulous, but neighbors fear intensive commercial development. So Hoffman has enlisted the aid of Jane West, “an attorney who specializes in environmental, land use and real estate issues.” West has already successfully challenged a projected Leggett development in Duval County in 2014. The community has thus advertised its commitment to fight Leggett every step of the way. The ball is now in his court. This edition of the annual pop culture convention features appearances by dozens of actors, writers and artists, representing pop properties as varied as Game of Thrones and Mighty Morphin Power Rangers. Noon-6 p.m. Friday, April 19; 10 a.m.-6 p.m. Saturday, April 20; 10 a.m.-5 p.m. Sunday, April 21, Morocco Shrine Auditorium, Southside, collectivecon.com, $15-$80. The British post-punk outfit lit up American college radio in the 1980s before shooting to superstardom when film director John Hughes wrote a teen blockbuster around their song, “Pretty in Pink.” Spacehog’s Royston Langdon opens. 7:30 p.m. Tuesday, April 23, Ponte Vedra Concert Hall, pvconcerthall.com, $46.50-$66.50. Time to worship the sun. California reggae duo The Wheeland Brothers and Amelia Island troubadour Sean McCarthy perform a complimentary all-ages concert on the beach. 6 p.m. Friday, April 19, Anastasia State Park, St. Augustine, floridastateparks.org/anastasia, free with park admission. Andrew Lloyd Webber’s musical adaptation of the hit film features 14 new tunes played by a for-real kids rock band. 7:30 p.m. Wednesday & Thursday, April 17 & 18; 8 p.m. Friday, April 19; 2 & 8 p.m. Saturday, April 20, Times-Union Center, Downtown, fscjartistseries.org, $42-$131.50. Featuring marching bands, storm troopers, pirates, royals and the Easter Bunny himself, the 60th annual edition of this St. Augustine tradition starts at the Old Jail and wends its way down San Marco Avenue to the Plaza de la Constitución. 9 a.m.-noon Saturday, April 20, Historic St. Augustine, free. This free, engaging program introduces students to a variety of zoo careers. Meet zoo staff, discuss college programs and volunteer opportunities, and learn all about day-to-day responsibilities for the critters and their homes. 10 a.m.-noon Saturday, April 20, Jacksonville Zoo & Gardens, jacksonvillezoo.org, free with online registration. The Flagler College men’s and women’s golf teams host the Peach Belt Conference Tournament. It’s three days and 54 holes of action on the Slammer & Squire course. Friday, Saturday & Sunday, April 19, 20 & 21, World Golf Village, St. Augustine, flaglerathletics.com, free. The Florida State USBC 85th Open Championship Tournament gets underway at two local bowling alleys. After the opening weekend, the tournament resumes May 4-June 20. Saturday & Sunday, April 20 & 21; Teams (9 a.m. & 1 p.m. both days): Batt Family Fun Center, 1838 Cassat Ave.; Doubles/Singles (9 a.m. & 2 p.m. both days): Bowl America Mandarin, 10333 San Jose Blvd., floridastateusbc.com, free to watch. Kids up to 12 years old may join the fun to find where the Easter Bunny hid 25,000 Easter eggs on base. 7-7:45 p.m. Wednesday, April 17, NAS Jacksonville McCaffrey Softball Complex, 542-3227 or nasjaxmwr@navy.mil, free. Must have base access. This global event, launched in South Sudan in 2012 as a way to bring friendly competition to enemy tribes, comprises an inclusive 5K run (or walk), followed by a social gathering to meet new friends. 11:30 a.m.-2:30 p.m. Saturday, April 20, 415 Pablo Ave., Ste. 140, Jax Beach, teamrwb.org. Every Sunday, Mario Peral’s Latin Jazz Band plays rumba, flamenco, salsa and mambo before a scenic Camachee Harbor. Visit the bar and you just might catch Dave Hammond, voted Best Bartender in our Best of Saint Augustine 2019 readers’ poll. 5-8 p.m. Sunday, April 21, Kingfish Grill, 252 Yacht Club Dr., St. Augustine, kingfishgrill.com, free. The Dance Shack hosts its monthly Latin Dance Party, preceded by a one-hour salsa dance class. All skill levels welcome. 8-11 p.m. Friday, April 19, The Dance Shack, 837 Southside Blvd. Ste. 1, Southside, thedanceshack.com, $5-$15. Rumba 106.9 FM and iHeart Radio personality Liliana Sanchez presides over a night of spicy Latin music. 8-11 p.m. Thursday, April 18, LIVE Bar, 331 East Bay St., Downtown, rumba1069.com, free. The weekly stroll is led by Friends of Hemming Park. Learn about public art and city history as you exercise. Walkers meet near the sculpture “Opposing Forces” on the corner of Monroe and Laura streets. 11:30 a.m.-12:30 p.m. Tuesday, April 23, Hemming Park, Downtown, hemmingpark.org, free. Several local organizations join forces for an Earth Day double-feature: a yoga class and a park clean-up. There are prizes for most cigarette butts collected and weirdest find. 5:30-7:30 p.m. Monday, April 22, Memorial Park, Riverside, cleanyour904.org, free. Can JACKSONVILLE follow NEW YORK into a GREENER FUTURE? NOW SHOWING CORAZON CINEMA & CAFÉ To celebrate Earth Day, Corazon and Panache jointly present March of the Penguins, noon; Sweetwater, 4 p.m. & Hometown Habitat, 7 p.m. April 19. $8 in advance, $10 door. Capernaum and Styx run. Throwback Thursday: Talk of Angels, noon April 18. SAFF presents The Beginner, noon April 20. 36 Granada St., St. Augustine, 679-5736, corazoncinemaandcafe.com. Game of Thrones 9 p.m. every Sun. WGHF IMAX THEATER Shazam, Pandas, Great Bear Rainforest and Great Barrier Reef screen. Avengers: Endgame starts April 25. World Golf Hall of Fame, St. Augustine, 940-4133, worldgolfimax.com. SUN-RAY CINEMA Pet Sematary, Climax, The Beach Bum and Transit screen. Diane, Her Smell and The Brink start April 19. Penguin Highway runs April 21 & 24. Avengers End Game starts April 26. 1028 Park St., 5 Points, 359-0049, sunraycinema.com. November; call 398-2890 for details. THE YELLOW HOUSE 577 King St., Riverside, 419-9180, yellowhouseart.org. CASBAH Café, 3628 St. Johns Ave. Goliath Flores every Wed. Jazz every Sun. Live music every Mon. Born in Georgia and raised in South Florida, TINSLEY ELLIS cut his teeth on 1960s British blues and 1970s Southern Rock before unveiling his own brand of note-bending, face-contorting guitar heroics in the 1980s. He appears here at 8 p.m. Friday, April 19, Ponte Vedra Concert Hall, pvconcerthall.com, $36.50-$38.50. SURFER the Bar, B 200 N. N First Fi t St. St Travis T i McCoy M C April A il 22. The Hip Abduction April 27 WHISKEY JAX, 950 Marsh Landing Pkwy. The Gunners April 17. The Groov April 19. 4Play anniversary concert April 20. Groov Band every Tue. Great Dames every Wed. The AMP, 1340 A1A Leon Bridges, Jess Glynne April 17. A Toast to the Coast: Wheeland brothers, Sean McCarthy, Anastasia Park. Santana April 20. Kelsea Ballerini, Brett Young, Brandon Ratcliff April 26 ARNOLD’S, 3912 N. Ponce de Leon Blvd. DJ Alex April 19. Fratello April 20 CAFÉ ELEVEN, 501 A1A Beach Blvd., St. Aug. Beach Lucy Kaplansky April 26 Planet SARBEZ, 115 Anastasia Blvd. The Swell Fellas April 27 PROHIBITION Kitchen, 119 St. George St. Justin Howl, 8Ballaitken April 18. Miranda Madison Music, Chillula April 19. G.W. Souther April 20. Sam Pacetti April 21. Tranquilo April 22. Colton McKenna April 23 TRADEWINDS Lounge, 124 Charlotte St. Live music April 19 & 20. Elizabeth Roth every Sat. Union Center for the Performing Arts GOV’T MULE May 3, The Florida Theatre KEM & JEFFREY OSBORNE May 4, Times-Union The KATE RAYS, SWINGERS PIECES LEFT, BRENDAN Center for the Performing Arts MORRISON April 27, Jack Rabbits TOM JONES May 6, The Florida Theatre The TEMPTATIONS, The FOUR TOPS April 28, The THY ART is MURDER May 6, 1904 Music Hall Florida Theatre TAME IMPALA, MDOU MOCTAR May 6, The Amp INDIA.ARIE April 30, The Florida Theatre BRYAN ADAMS May 6, Daily’s HEART ATTACK MAN, FREE THROW, SEAWAY April 30, TYLER CHILDERS May 7, The Amp Backyard Stage 1904 Music Hall INTERPOL May 7, The Florida Theatre FAYE WEBSTER, LORD HURON May 1, Mavericks Live GRETA VAN FLEET May 9, Daily’s TRACE ADKINS, CLINT BLACK, CHASE RICE, STEVIE STONE, MADCHILD May 9, Surfer the Bar GRETCHEN WILSON, CRAIG CAMPBELL, FRANKIE JUICE WRLD, SKI MASK the SLUMP GOD, LYRICAL BALLARD, HANK WILLIAMS JR. May 1-4, Suwannee LEMONADE ALLSTARS May 9, The Amp Music Park MADCHILD & STEVIE STONE May 9, Surfer the Bar FUN SICK PHONY May 1, The Volstead DAVE MATTHEWS BAND May 1, Veterans Memorial Arena B2K Millennium Tour: BOOG, OMARION, RAZ B, FIZZ, MARIO May 10, Veterans Memorial Arena TAUK, The GROOVE ORIENT May 1, 1904 Music Hall BLACK DAHLIA MURDER, TRAITORS May 10, 1904 The MILK CARTON KIDS, DARRIN BRADBURRY May 1, Music Hall Ponte Vedra Concert Hall ‘A Little Night Music: MAMA BLUE May 10, Plaza de la Welcome to Rockville: KoRN, The PRODIGY, WAGE Constitución WAR, EVANESCENCE, FLOGGING MOLLY, TASH SULTANA, PIERCE BROS. May 11, The Amp CLEOPATRICK, DIRTY HONEY, JUDAS PRIEST, St. Augustine BREWERS’ FEST: The FIREWATER TENT YELAWOLF, TOOL, INCUBUS, PAPA ROACH, The REVIVAL, LONESOME BERT & the SKINNY LIZARD May STRUTS, FEVER 333, WHILE SHE SLEEPS, The 11, Fountain of Youth DIRTY NIL, CHEVELLE, SHINEDOWN, BRING ME the STAR TREK LIVE feat. MICHAEL GIACCHINO May 11, HORIZON, The CULT, IN THIS MOMENT, KILLSWITCH Daily’s ENGAGE, CIRCA SURVIVE, TOM MORELLO, MARK RUSS LIQUID, BELLS & ROBES May 11, 1904 Music LANEGAN BAND, BEARTOOTH, ARCHITECTS, The Hall INTERRUPTERS, BLACK LABEL SOCIETY, TREMONTI, REIGNWOLF, BADFLOWER, The DAMNED THINGS, The CAMILLE RAE TRIO May 12, Arnold’s Lounge Second Sunday at Stetson’s: WILLIE GREEN May 12, GLORIOUS SONS, DOROTHY, BLACK PISTOL FIRE, Beluthahatchee, Fruit Cove YUNGBLUD, ZEAL & ARDOR, HANDS LIKE HOUSES, BOB SEGER & the SILVER BULLET BAND May 12, MOVEMENTS, HYRO the HERO, LIGHT the TORCH, Daily’s WILSON, AMIGO the DEVIL, PRETTY VICIOUS, DEMOB MARC REBILLET May 13, 1904 Music Hall HAPPY, CLEOPATRICK, SHVPES, HYDE, DEAD GIRLS MURS, LOCKSMITH, COJO May 14, Jack Rabbits ACADEMY May 3, 4 & 5, Metro Park G. LOVE, The RIES BROTHERS May 14, Surfer the Bar LITTLE BIRD May 3, Surfer the Bar YHETI, EAZYBAKED, DREWLFACE, SFAM, VLAD the 24th annual Gamble Rogers Music Festival: AL INHALER May 15, Myth Nightclub POINDEXTER, AMY HENDRICKSON, ASLYN & the BRETT BASS & the MELTED PLECTRUM May 17, Blue NAYSAYERS, BRETT BASS & the MELTED PLECTRUM, BRIAN SMALLEY, CHELSEA SADDLER, DAVE DOWLING, Jay Listening Room DON’T CALL ME SHIRLEY May 17 & 18, Flying Iguana DAVIS & the LOOSE CANNONS, DOM FLEMONS, DOUG G-LOVE May 17 & 18, Café Eleven SPEARS, DUNEHOPPERS, EDEN REWA, ELAINE & GARY STARLING QUARTET May 17, Hemming Park SAM MAHON, FIONA CHALMERS, GATORBONE TRIO, The ORIGINAL WAILERS May 17, Surfer the Bar GRANT PEEPLES, GYPSY WIND, HAWKTAIL, JAMIE The WILDFLOWERS Tom Petty Tribute Band May 18, DEFRATES, JERRY MINCEY, JOE MARK, JOHN DICKIE Suwannee Music Park IV & COLLAPSIBLE B, JORDAN FOLEY, KATHERINE ONE NIGHT in MEMPHIS May 19, Thrasher-Horne ARCHER, KRICKETS, LON & LIS WILLIAMSON, Center for the Arts LONESOME BERT & the SKINNY LIZARDS, MICHAEL JIMMY EAT WORLD, TAKING BACK SUNDAY, BLUE JORDAN, MR. AULLIE, PARADOX, PASSERINE, OCTOBER, FLORA CASH May 19, The Amp PHOEBE HUNT & the GATHERERS, PIERCE PETTIS, BEAR & ROBERT CD Release May 19, Blue Jay RACHEL GRUBB, RED HENRY & FRIENDS, REMEDY FRAMING the RED May 19, Jack Rabbits TREE, RON & BARI, SALT & PINE, SAM PACETTI, The JOE JACKSON May 21, The Florida Theatre CURRYS, The OBSCURE BROTHERS, The SKINNY, HOZIER May 21, Times-Union Center The TROUBADOURS (Bob Patterson, Jim Carrick, Larry WINEHOUSED: The Amy Celebration May 25, Ponte Mangum, Charley Simmons), The WILLOWWACKS, TODD Vedra Concert Hall JONES, UNCLE MOSIE, VERLON THOMPSON, WAX FLORIDA FOLK FESTIVAL May 24, 25 & 26, Stephen WINGS May 3, 4 & 5, Colonial Quarter Foster Folk Culture Center State Park, White Springs DiCARLO THOMPSON May 3, Coop 303 STEEL PANTHER, WILSON, TRUE VILLAINS May 28, 8TH & RED May 3, Lynch’s Irish Pub Mavericks GRIZ May 3, The Amp TREY ANASTASIO & his Band May 29, The Amp MERCY ME May 3, Veterans Memorial Arena ART GARFUNKEL May 30, Ponte Vedra Concert Hall Prince Tribute Show: PURPLE REIGN May 3, TimesBEASTO BLANCO May 31, Jack Rabbits LIONEL RICHIE June 1, Daily’s Place The FRITZ June 1, 1904 Music Hall MICKEY AVALON, DIRT NASTY June 1, Jack Rabbits The TURTLES, CHUCK NEGRON, GARY PUCKETT, The BUCKINGHAMS, The CLASSICS IV June 2, Florida Theatre LAKE STREET DIVE, The RAD TRADS June 5, Ponte Vedra Concert Hall STEVE EARLE & the DUKES June 6, Ponte Vedra Concert Hall The RISE TO SLAUGHTER showcase series travels from city to city, shining a spotlight CREEPING DEATH, on up-and-coming local bands (and encouraging said bands to hawk pre-sale tickets). PLAGUE YEARS June This Jax edition features DANCING WITH GHOSTS (pictured) plus The Fallen Sons, 6, Nighthawks Giants of Atlantis, Disdain, A Wolf Amongst Sheep, Blood Bath and Beyond, Corrupted SLIGHTLY STOOPID, Saint and Silent/Running. 4 p.m. Sunday, April 21, at 1904 Music Hall, Downtown, 1904musichall.com, $10. MATISYAHU, TRIBAL SEEDS, HIRIE June 6, The Amp STEPHEN SIMMONS June 7, Mudville Music Room The CHRIS THOMAS BAND June 8, TIAA Bank Field, Boys & Girls Club Benefit WEIRD AL YANKOVIC June 9, The Amp LIVE FROM MARS: David Bowie Tribute June 12, The Florida Theatre TWENTY ONE PILOTS June 14, Veterans Memorial Arena ROD McDONALD June 14, Mudville Music Room The MIGHTY O.A.R., AMERICAN AUTHORS, HUNTERTONES June 15, The Amp GREAT ATLANTIC Country Music Fest June 15, SeaWalk Pavilion, Jax Beach Free Energy Tour: The HEAVY PETS, ROOSEVELT COLLIER BAND June 16, 1904 Music Hall BRIT FLOYD 40 Years of The Wall June 16, Florida Theatre The NATIONAL, COURTNEY BARNETT June 17, The Amp Texas-born R&B singer LEON BRIDGES marries classic soul style with HIPPO CAMPUS June 17, Ponte contemporary pop production values. Last year’s Good Thing tour was so successful, Bridges added a second leg in 2019. British singer/ Vedra Concert Hall songwriter Jess Glynne opens. 7 p.m. Wednesday, April 17, The Amp, AGENT ORANGE June 18, Surfer St. Augustine, staugamphitheatre.com, $29.50-$84. (Photo by Jack McKain) the Bar FLOW TRIBE June 22, Hemming Park BOOK of LOVE Sept. 7, Jack Rabbits BOWLING for SOUP, REEL BIG FISH, NERF HERDER CHRIS YOUNG, CHRIS JANSON, LOCASH Sept. 12, June 22, The Amp Backyard Stage Daily’s JON BELLION, MARC E. BASSY, LAWRENCE June 23, BEATLES vs STONES Sept. 16, Ritz Theatre The Amp KASEY MUSGRAVES benefit Sept. 21, The Amp TEDESCHI TRUCKS BAND, BLACKBERRY SMOKE, PUDDLE of MUDD, SALIVA, TRAPT, SAVING ABEL, SHOVELS & ROPE June 28, Daily’s Place TANTRIC Sept. 21, Thrasher-Horne Center LADY ANTEBELLUM June 28, The Amp ALAN JACKSON, WILLIAM MICHAEL MORGAN Sept. 21, YACHT ROCK REVUE June 28, The Florida Theatre Veterans Memorial Arena ADAM SANDLER June 30, The Amp SNARKY PUPPY Sept. 24, The Florida Theatre ROB THOMAS, ABBY ANDERSON July 6, Daily’s Place THOMAS RHETT, DUSTIN LYNCH, RUSSELL TRAIN, GOO GOO DOLLS, ALLEN STORE July 9, Daily’s DICKERSON, RHETT AKINS Oct. 4, Veterans Memorial NEW KIDS on the BLOCK July 12, Vets Memorial Arena Arena JOJO SIWA July 13, The Amp BUILT to SPILL Oct. 9, Jack Rabbits LONG BEACH DUB ALL STARS & AGGROLITES, MIKE Suwannee Roots Revival: OTEIL & FRIENDS, LEFTOVER PINTO July 14, Surfer the Bar SALMON, DONNA the BUFFALO, KELLER WILLIAMS’ KIRK FRANKLIN July 15, The Florida Theatre PETTYGRASS, The HILLBENDERS, JIM LAUDERDALE, The Royal Affair: YES, ASIA w/ STEVE HOWE, JOHN VERLON THOMPSON, REV. JEFF MOSIER, BRETT BASS LODGE (Moody Blues), CARL PALMER’S ELP LEGACY & MELTED PLECTRUM, CORBITT BROS., JON STICKLEY, with ARTHUR BROWN July 18, The Amp The LEE BOYS, SAUCE BOSS, WHETHERMAN, BELLE DIERKS BENTLEY, JON PARDI, TENILLE TOWNES July & the BAND, QUARTERMOON, PETER ROWAN FREE 18, Daily’s MEXICAN AIRFORCE, BRUCE COCKBURN, The SELDOM YOUNG the GIANT, FITZ & the TANTRUMS, COIN July SCENE, HORSESHOES & HAND GRENADES, SAMANTHA 19, The Amp FISH, DUSTBOWL REVIVAL Oct. 10-13, Spirit of the BRETT BASS & the MELTED PLECTRUM, RUSTY Suwannee Music Park SHINE, SALT & PINE July 20, Hemming Park CHRIS STAPLETON, KENDELL MARVEL, DAVE COBB, SUBLIME with ROME, MICHAEL FRANTI & J.T. CURE, DEREK MIXON, MORGANE STAPLETON Oct. SPEARHEAD, COMMON KINGS July 25 & 26, The Amp 10, Veterans Memorial Arena ANUEL AA July 20, Daily’s Place MAGGIE ROGERS, JACOB BANKS Oct. 11, The Amp IRATION, PEPPER, FORTUNATE YOUTH, KATASTRO BENISE Oct. 13, The Florida Theatre July 27, The Amp CHEAP TRICK Oct. 16, The Amp DONAVON FRANKENREITER July 29 & 30, 1904 ZAC BROWN BAND Oct. 17, Daily’s Place Music Hall CARRIE UNDERWOOD Oct. 20, Veterans Memorial WYNONNA JUDD July 29, Orange Park Freedom Fest Arena IYANLA VANZANT Acts of Faith Remix Tour Aug. 2, ACOUSTIC ALCHEMY Oct. 31, Ponte Vedra Concert Florida Theatre Hall WIDESPREAD PANIC Aug. 2, 3 & 4, The Amp RUPAUL’S DRAG RACE Nov. 2, The Florida Theatre WHY DON’T WE Aug. 2, Daily’s Place JUKEBOX HERO Nov. 10, The Florida Theatre DIRTY HEADS, 311 Aug. 4, Daily’s Place SARA BAREILLES Nov. 22, Daily’s Place MOE., BLUES TRAVELER, G. LOVE Aug. 7, Daily’s JOHN OATES & the GOOD ROAD BAND Nov. 24, Ponte LYLE LOVETT & HIS LARGE BAND Aug. 9, Florida Theatre Vedra Concert Hall NICK JORDAN Aug. 13, Jack Rabbits A PETER WHITE CHRISTMAS: EUGE GROOVE, VINCENT REBELUTION, PROTOJE, COLLIE BUDDZ Aug. 14 & 15, INGALA, LINDSEY WEBSTER Dec. 10, Ponte Vedra The Amp Concert Hall BRAD PAISLEY, CHRIS LANE, RILEY GREEN Aug. 16, CELINE DION Jan. 8, Veterans Memorial Arena Daily’s Place KANSAS: Point of Know Return Tour Feb. 1, The Florida UMPHREY’S McGEE, MAGIC CITY HIPPIES Aug. 17, Theatre The Amp AL STEWART Feb. 14, Ponte Vedra Concert Hall STEWART TUSSING Aug. 17, Mudville Music Room BUSH, LIVE, OUR LADY PEACE Aug. 18, Daily’s Place PENTATONIX, RACHEL PLATTEN Aug. 24, Daily’s VAMPIRE WEEKEND, CHRISTONE ‘KINGFISH’ INGRAM To list your band’s gig, send time, date, location (street, Aug. 25, The Amp city or neighborhood), admission and a contact number 40th Anniversary Tour: ORCHESTRAL MANOEUVRES in to Marlene Dryden, email mdryden@folioweekly.com or the DARK Aug. 30, Ponte Vedra Concert Hall 45 W. Bay St., Ste. 103, Jacksonville FL 32202. Items PETER FRAMPTON, JASON BONHAM Sept. 4, Daily’s are included on a space-available basis. Deadline is noon Wednesday for next Wednesday publication. blue area is subject to being trimmed as this area is used as a margin or buffer to feeds the need Trapzone House Chicken compensate p for trimmer fluctuation. Red area is the bleed a area. Any bleeds should extend to AT LEAST tthe outside edge of the red area. ANYTHING G contained in this red d off. If your bleed does area WILL be trimmed not extend far enough h into the red area, it is possible that, due to trrimmer fluctuation, there may be white space lefft after the trim is made. Again, for best results, extend the bleed all the way y to the outside edge e g of the red area. went by fast!). And it’s the time of year to enjoy the virtues of one of the quintessential foods of spring and summer: the blue crab. Though live blue crabs are not widely available down here in the 904, where I’m from, they’re the kings of spring and summer seafood. The Chesapeake Bay, which splits Maryland’s Western Shore, aka Baltimore/D.C. Loop, and its historical, genteel Eastern Shore, is home to the indisputably best crabs on the planet. They are, of course, blue crabs, renowned worldwide for their delicate, succulent flavor and exquisite texture. When I was a kid, the extended family would pack into our non-air-conditioned cars during the sweltering summer months and head to the bay. We were not seeking standard fun in the sun beaches or puttputt golf. Instead, we were headed toward the creeks which empty into the greater Chesapeake estuary. It was there that the crab shacks stood—or more likely, leaned. These were old clapboard structures, precariously purchased on ancient rotting wooden docks. In the summer heat, folks like us flocked to gorge ourselves on as much hot, Old Bayseasoned, steamed blue crab and beer (no doubt National Boh) they could possibly hold. But there was much more to this than eating some crab meat. This was a ritual practiced by generations of locals, a time-honored tradition which involved all of the senses. One did not just stop by and ‘eat some crab.’ These crab shacks were completely open to the outdoors, no windows, just screens and no fancy restaurant amenities, like plates or napkins or tablecloths. You’d sit on old-time picnic tables covered with brown butcher paper. Rolls of paper towels were positioned at each end and, of course, there were several of the most important accessories, small wooden mallets and metal picks. The beer and sodas were delivered in pitchers and the crabs themselves were brought in a large metal pail by a waitress, dumped directly on the table. Often, there was a good-sized hole in the middle of the table, with a big bucket directly below. That’s where we’d toss the few parts of the delicious darlings of the deep we didn’t eat. Now the almost-primeval fun begins. Everyone grabs several of still-steaming crustaceans, trying not to burn their fingers. They first tear off the hapless creatures’ legs. Mmmm, the aroma of the exposed meat was beyond intoxicating. Now the mallet was raised up for its first blow to those claws; getting the fatty meat from those pinchers wasn’t easy without a fight. The bodies were then dissembled revealing the back-fin lump meat, which we would dip into a mixture of Old Bay seasoning and white vinegar—some locals dipped the meat in melted butter. You have no idea how much I wish I was wrist-deep in this ritual right now! And the crab meat was enhanced with sides such as this tangy barbecue slaw. FOLIO BEER’S BREWERY COMMUNITY AARDWOLF BREWING CO. ANCIENT CITY BREWING 3420 Agricultural Ctr. Dr.
ENGINE 15 DOWNTOWN 633 Myrtle Ave. N.
LOCAL PET EVENTS & ADOPTABLES S SAFARI EGGscursion • It’s a non-traditional egg hhunt–guests search for egg signs in areas of the zoo, bbased on their age. There are prize drawings, a DJ, bbunny ear crafts, relay races, lawn games, goodie bags aand a visit from that hoppin’ dude himself, the Easter BBunny. It’s from 10 a.m.-1 p.m. on Saturday, April 20 at Jacksonville Zoo & Gardens, 370 Zoo Pkwy., Northside, Ja 757-4463, jacksonvillezoo.org. Free with regular zoo admission. Proceeds benefit zoo programs. ancestral pedigree roots can be traced back to ancient times, but the noble greyhound is one who can. Greyhounds have been around for about 3,500 years and are believed to have mingled with ancient Egyptians and Greeks. They’re even mentioned in the Bible (Proverbs 30:29-31, Old Testament). Above all, greyhounds are sprinters at heart, but when they’re not running, their favorite thing to do is absolutely nothing, earning them the nickname 40-mph Couch Potatoes. Rather than springing into action at any noise or movement, this breed would rather take leisurely naps on the couch with their favorite human. because I was slow—I’m actually superfast, but I liked to chase other dogs, so I’d hang back from the pack and run right up their heels. Where is your happy place? The couch! What accomplishment of yours makes you proudest? My ability to fall asleep anywhere, no matter what’s going on around me. I once slept through the Jazz Festival. How do you show people you care? When I like someone, my tail wags a mile a minute! I also shake my head and bottom at the same time. Weird, right? What’s the best compliment you’ve ever received? I’m often told I’m beautiful and sleek. Mom calls it “supermodel chic.” In what way would you make the world a better place? I’d teach people to just stop, roll over and relax. What makes you feel thankful? As a dog who suffers from separation anxiety, I’m most thankful for places that make me comfortable, like home. In one word, describe your family. Love. I never expected to learn so much about greyhounds, but here I am, brimming with knowledge about this remarkable breed. Spending time with Grace has taught me so much about the finer points of this gentle companion breed—they’re almost like royalty! And there are so many in shelters and Humane Societies ready to join your happy family! Davi April is National Adopt-a-Greyhound Month, so it’s the perfect time to make a new fast friend. If you’re looking for a friendly, gentle dog with plenty of love to give, an elegant greyhound may be the right pet for you! STRAIGHT UP, NOW TELL ME: do you really wanna love me purr-ever? I’m Paula, and I like to think I was named for Ms. Abdul, my fave pop icon. JHS is cool, but I’d love to have a bigger space to relax, and take naps. I’m quite a chill gal who’d like to unwind from a long day with my hooman by my side. Come by 8464 Beach Blvd. and meet me today! I’ll be fur-ever your girl, so Rush Rush! EASTER ADOPTION SPECIAL • At Jax Humane Society, pick an egg to reveal your special pet adoption price, 10 a.m.-5 p.m. Saturday and Sunday, April 20 and 21 at Jacksonville Humane Society, 8464 Beach Blvd., Southside, 765-8766, jaxhumane.org. FIRST COAST CLASSICAL DRESSAGE SHOW • The schooling show is 8 a.m.-5 p.m. Saturday, April 20 at Jacksonville Equestrian Center, 13611 Normandy Blvd., Westside, 255-4254, fccds.org, jaxequestriancenter. com. And as always, admission and parking are free. COMMUNITY ANIMAL COMMUNICATION READINGS • Constance Frankenberg offers half-hour readings, $45, at Salty Paws Healthy Pet Market, 677 Atlantic Blvd., Atlantic Beach, by appointment only, call for dates, 800-588-3659, constancefrankenberg.com. BYOB PUGS • Bring Your Own Breed honors this cute breed, 6:30-8:30 p.m. April 19 at Kanine Social, 580 College St., Brooklyn, 712-6363, kaninesocial.com. Noon-2 p.m. it’s Bring Your Own Corgis! ROMEO, ROMEO … could you be my Romeo? I promise we’ll have a happy ending! I’m a sweet, polite senior girl looking for someone to cuddle. If you’re willing to share your Pup-Peroni, even better. Let’s meet at Jacksonville Humane Society! I’ll be waiting for you in Suite 6. DOGGONE EASTER EGG HUNT • Friends of Clay County Animals and Woof Gang Bakery host the seventh annual hunt, with Easter Bunny photo ops, bounce house, bake sale, silent auction, raffles, food truck and flyball demos, 11 a.m.-3 p.m. Saturday, April 20 at Orange Park Town Hall, 2042 Park St., friendsofclaycounty animals.org. Proceeds benefit FOCCA programs. SPIRIT THE R.E.A.D. DOG • Kids practice reading to Spirit, a therapy dog who loves to listen, 2:30-3:30 p.m. April 24 at Beaches Branch Library, 600 Third St., Neptune Beach, 241-1141, jaxpubliclibrary.org. PET PHOTO SHOOT • A fundraiser for Pit Sisters, a rescue, rehab and outreach nonprofit facility helping bully-breed dogs, is 6 p.m. April 24, Hotel Indigo, 9840 Tapestry Park Cir., Southside, pitsisters.com. Sign up at agoldphoto.com. Voted Best Jeweler in FW's Best of Jax readers' poll! FOLIO WEEKLY helps you connect with a person you’ve seen and want to get to know. Go to folioweekly.com/i-saw-u.html, fill out the FREE form correctly (40 words or fewer, dammit) by 5 p.m. THURSDAY for the next Wednesday’s FW. An especially great day this week: Wednesday, April 17 is BLAH, BLAH, BLAH DAY and a PRINCESS’ BIRTHDAY! (It’s her seventh 27th birthday!! Love you, Abs!) Thursday, April 18 is Newspaper Columnists Day and National High-Five Day (down low; too slow). 4/20 (get it? heh heh) is Look Alike Day (look like who? ), 4/22 is National Jelly-Bean Day. Then … you know it: Find love with FW’s ISUs. ARIES (March 21-April 19): French writer Simone de Beauvoir sent a letter to her lover, Aries author Nelson Algren. She wrote, “I like so much the way you are so greedy about life and yet so quiet, your eager greediness and your patience, and your way of not asking much of life and yet taking much because you are so human and alive that you find much in everything.” Embody that state in the weeks ahead. In my astrological opinion, you are mandated to be utterly relaxed and totally thrilled; satisfied with what life brings and skillfully avid to extract the most out of it; at peace with what you already have and primed to get much more. TAURUS (April 20-May 20): The Beat Generation of American poets arose in the late 1940s as a rebellion against materialistic mainstream culture and academic poetry. It embraced sexual liberation, Eastern spirituality, ecological awareness, political activism and psychedelic drugs. One of its members, Jack Kerouac, tweaked and ennobled the word “beat” to serve as the code name for their movement. In its old colloquial usage, “beat” meant tired or exhausted. But Kerouac re-consecrated it to mean “upbeat” and “beatific,” borrowing from the Italian word beato, translated as “beatific.” You’re on the verge of a similar transition, from the old meaning of “beat” to the new. GEMINI (May 21-June 20): “Scattered through the ordinary world, there are books, artifacts and perhaps people who are like doorways into impossible realms, of impossible and contradictory truth.” Argentinian author Jorge Luis Borges said that, and now you have it, just in time to enter a phase when such doorways will be more available. Use Borges’ counsel as a reminder to be alert for everyday situations and normal people to lead you to intriguing experiences, extraordinary revelations and life-changing blessings. CANCER (June 21-July 22): The FreeWill Astrology Committee to Boldly Promote Cancerian’s Success is glad to see you’re not waiting for opportunities to come to you. You’re tracking them down and proactively wrangling them into a form that’s workable for you. You seem to have realized what you had assumed was your fair share isn’t actually fair; you want and deserve more. Though you’re not being mean and manipulative, nor are you overly nice and amenable; you’re pushing harder to do things your way. I approve! I endorse your efforts to take it even further. LEO (July 23-Aug. 22): Many experts who’ve studied the art and science of running fast believe it’s best if a runner’s legs are symmetrical and identical in their mechanics. That theory isn’t supported by the success of champion sprinter Usain Bolt. Because he’s suffered from scoliosis, his left leg is a half-inch longer than his right. With each stride, his left leg stays on the track longer than his right, and his right hits the track with more force. Some scientists speculate this unevenness not only doesn’t slow him down, but may enhance his speed. In accordance with current astrological variables, you’ll be able to thrive on your asymmetry in the weeks ahead, just as Bolt does. VIRGO (Aug. 23-Sept. 22): Virgo adventurer Jason Lewis traveled the world using transportation powered solely by his own body. He walked, bicycled, skated, rowed, pedaled and swam more than 46,000 miles. Make him your role model for the next four weeks. You’re primed to accomplish gradual breakthroughs through the use of simple, persistent, incremental actions. Harnessing your physical vitality’s power is an important factor for success. have no problem fi nding funds to float more volunteers up in them streets. One would expect guys like John Morgan and good ol’ Roger Stone to start publicizing these efforts as we get into summer. I’ve looked around and asked around in the days since, but so far, no one I know has seen any petitions being collected anywhere except in St. Augustine. Nothing in Five Points, nothing at the Beach(es) and nothing Downtown at ArtWalk–not yet, anyway. But, folks, this is the only path forward at the mo. Remember, a recent bill to fully legalize died a quiet death in the state legislature a couple weeks ago, as Governor Ron DeSantis was mum on the matter. At the current pace, Regulate Florida needs to average about 2,600 signatures every day for the next 10 months to make the ballot. If it happens, if voters are given the choice, passage seems inevitable. But crunch time is coming (actually, it’s already here), and Regulate Florida needs all the help it can get. If you’d like to sign up, or to help others sign up, go to regulatefl orida. com and get those deets, dilly-dilly, be he a stud or she be a filly. If you support full legalization–and I know you do–then it’s all hands on deck. NOW! Suite 902, Jacksonville, Florida 32207 location. help you find your Perfect Match™ today! dock, hammocks, music, fire pit. Total privacy. Harrell, a National Board Certified Health & Wellness Coach and a Certified Health Education Specialist, is a University of North Florida Master of Public Health graduate student. She lives in St. Johns County. FOLIO FOLI FO L O WE LI WEEK WEEKLY EKLY EK LY we wel welcomes lcom lcom lc omes es Ba BBackpage ack ckpa page ge ssubmissions. ubbmi miss iss ssiio ionss. Th They ey sshould houl ho uldd be 11,200 ul ,200 words ,2 wor ords ds or or fewer fewe fewe fe werr and and on a topic top opiic ic ooff local loca loca lo call inte iinterest nte tere reest aand/or nd/o nd /orr co /o conc concern. ncer nc ernn. SSend er endd yo en yyour ur ssubmissions ubbmi miss iss ssio ions io ns ttoo mail m mail@folioweekly.com. ail@ @folioweekly.com. Opinions expressed on the Backpage are those of the author and do not necessarily reflect those of Folio Weekly.